Analytic rubrics attempt to measure performance by breaking it down into it’s component parts. Examples are available in the IPA books by ACTFL (Adair-Hauck, Glisan, & Troyan, 2013). I have used them so often that I stopped asking why. At first glance, this type of rubric seems to offer a logical way to measure performance by breaking it down into it’s component parts. It also communicates detailed expectations to the students. 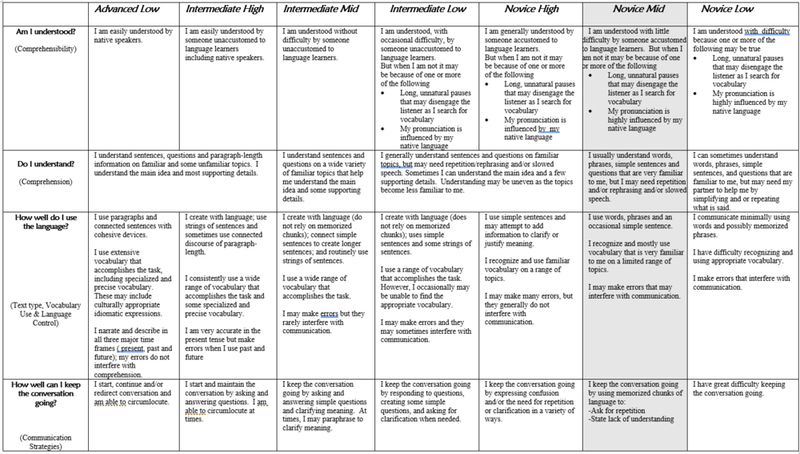 A team of Bellevue teachers started with the FLENJ Interpersonal Rubric (Foreign Language Education of New Jersey, n.d.) They liked how well it aligned with the performance guidelines, but they thought the language was too dense for both teachers and students. To use an analytic rubric like this, my students and I must simultaneously keep in mind 28 different descriptions. Look at how much text there is the page. 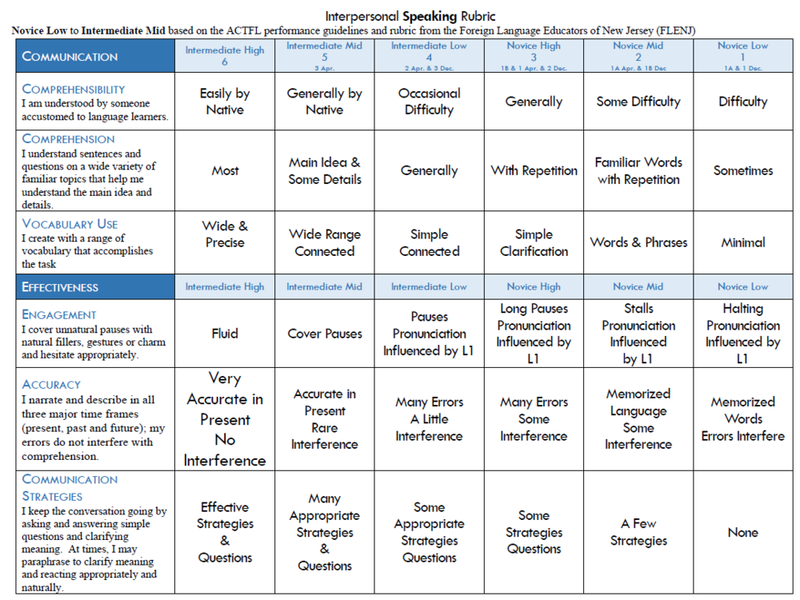 We instead attempted to simplify the rubric by grouping into two sections with sub categories. By focusing on communication and effectiveness, we liberated ourselves from error counting. Since these rubrics were intended for levels I, II, and III in secondary, almost none of our students would perform higher than Intermediate. Do all the metrics really have the same value? How do I calculate a grade with an analytic rubric? *These findings are purely anecdotal based on a decade of using these rubrics with students in 6-12 grade in three states. Adair-Hauck, B. (University of P., Glisan, E. W. (Indiana U. of P., & Troyan, F. J. (Ohio S. U. (2013). Implementing Integrated Performance Assessment. (M. (ACTFL) Abbott & P. (ACTFL) Sandrock, Eds.) (2nd Edition). Alexandria, VA: The American Council on the Teaching of Foreign Languages.